Take a look back at the creative, fun maps that IROQ Clan custom made for Quake 2. “IROQ Clan was formed on September 19, 2000 by Terry and Robin Emerson (A.K.A IROQ_Venom and IROQ_Vixen_). 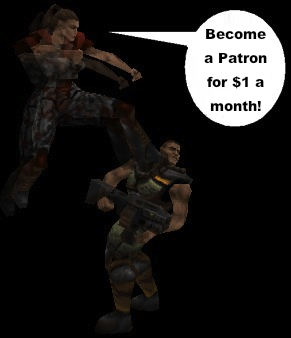 IROQ was created based on the simple idea of bringing a group of people together online who shared the same love for the game as we did, and who were looking for that special ingredient that a lot of other Quake 2 clans fail to offer. Thank you for watching! Dedicated to IROQ_Vixen and the Immortal Rulers of Quake. Insane Weapons Mod: The most insane Quake II mod ever!